A three-month report on the progress of gate latching and the TAP fare media on the Red/Purple Line subway will be presented to a Los Angeles County Metropolitan Transportation Authority (Metro) board committee Thursday, including preliminary data showing that more people are paying the proper fare, resulting in increased revenue for Metro. Sixteen gates on the Red/Purple Line subway were latched between June 19 and August 5 this past summer. Sutton stressed that while this is an encouraging sign, data from a three month sample isn’t enough to verify a trend in terms of more revenue or previous rates of fare evasion. “When latching is completed on the light rail system we will be able to compile a larger sample to help tell us the level of success of latching the gates,” Sutton said. Gate latching at five Gold Line stations was completed on September 16. Latching is scheduled to be completed for six Blue Line stations by Dec. 9 and 14 Green Line stations by January 13, 2014. Gate latching and the use of the TAP fare media are integral to the development of a seamless, regional transit network. Metro, Metrolink, Access Services and nine municipal transit systems are currently on the TAP network. By the end of 2014, 26 operators will recognize TAP as fare media. TAP is the largest and most successful smartcard fare media in North America with 1.2 million passes sold monthly. TAP is used for 22 million boardings per month and is accepted on at least 3,800 buses in the region. I’ve seen numerous people jump the turnstyles or simply walk through the door that people hold open for them from the other side. They should have cameras posted if they really want to catch the scofflaws. What about the people that transfer to another train. I notice those people are not tapping. I agree, I always see people cross over the turnstyles. It’s just my observation. take a pic and report it. Metro has a snitching app you can use to send in reports of people doing bad things on the metro. Used it once when I saw a tagger tagging a train. The gates already have cameras and loudspeakers. They aren’t effective tools to fight the fare evaders who are jumping the turnstiles or abusing the emergency gates. They should staff one officer right at the gates to keep a close eye out on those who try fishy things. It’s a strategy that every gated city has adapted. Metro should stop trying to take the cheap way out. Shocking. Making people pay for something shows increased revenues (in sarcastic tone)? Imagine how much money has been lost if there were gates up when Metro Rail first started? From my experience of the last couple of months is people not tapping on transfers an hopping gate or waiting for people to go through the other turnstyles with the opening. However I also observed that once you tap at that particular station and go back out through for what ever reason you are not allowed back in the second time. The system says you already tapped. I have also seen a fair share of people who have been caught as their cards have read as invalid.. So that is a positive. 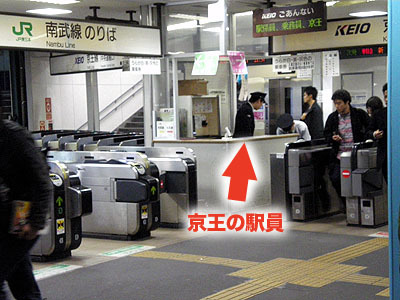 To solve the problem of people transferring from rail to rail, maybe somehow after a person exits the train, the chip used in the tap system can recognize that person has left the train vehicle after maybe a minute or so and reset the card. In the even they get caught on the train, the card would read invalid. I don’t know, just and idea.. Yes and Metro also says taking photos in public is illegal because of privacy and terrorism laws. They want you to be a snitch and make an app for it, but other part says photography is illegal. One part says this, the other part says that which contradicts each other. There’s government for you. Either photography is legal because expectation of privacy does not exist in public spaces (public roads, sidewalks, stations, inside the train, anything that is paid for with taxes = public space) or photography is illegal due to privacy and terrorism concerns. Which is it Metro? Clarify. There are still many leaks in Metro’s pay-to-ride system. The ADA gates are a big problem in that they allow “sneakers” (people who sneak in behind a paying customer before the gate closes again), and “kickers” (people who found that they can kick the gate to get it to open”, and “sliders” (people who found that they can slide their foot under the gate to trigger the proximity sensor from the other side). Another major leak are the stations (Gold/Blue lines, Blue/Expo/7th Metro Transfer) that don’t have gates. The tap validators are a joke. Daily I see people pass right by without even a thought to tapping. Imagine how much revenue could be realized if Metro decided to run the system like a real business and make all customers pay for the service. I’m extremely happy with the gate-locking that Metro has installed. However, as other commentors here are mentioning, I’m seeing an increase in people who are routinely trying to sneak through the ADA compliant entrance gate due to it not having a rotating barrier like the other entrances. Something needs to be done to address the people who sneak through the ADA gates. Jordan Marshall, The TAP cards cannot be used more than once per seven minutes. This is done to avoid passengers attempting to hand it to someone behind them. LA of Anaheim-That problem is nationwide. When in NY and Boston, I saw the same thing happening. People also jump the turnstiles. Not much can be done besides more security. At Metro Center, people who are perceived to not be tapping when transferring could be using the Flower St exit. Now, can we get a enter exit system? This two way deal stinks at rush hour. I look at our systems stations today. and soak in the open airness, since eventually I can see them caging a sectioning areas to help traffic and increase revenue. Good job metro, shame that they may have lost a billion dollars in 20 years…. I have no idea where you got the billion dollar figure from. Metro has certainly not said that, nor does the agency agree with your number. There are other ways to do it without heading down the police state path. How about adding in Metro Customer Service desks right where the gates are? That way, Metro reps can help out confused passengers, give out directions to tourists, and keep an eye out on fare evaders abusing the ADA gates at the same time. If you’re going to need to add “security” why not do something helpful at the same time? Hopefully, it shouldn’t be done glass encasings like SF MUNI example above. It should be an open air kiosk like how Japan does it because you can’t hear anything, especially when the station has a lot of people, if the customer service rep is behind a glass. Yeah, yeah. I know, I know, the excuse is going to be we have no money for this. Well, other cities around the world can figure out how to find the money to do add customer service desks near the gates, so why can’t Metro? There must be plans to make the TAP readers at Willowbook/Rosa Parks work in both directions. Right now, ALL of the TAP machines have 1 side that works, despite there being readers on both ends. This is such a major transfer station so the TAP readers should work especially if there are plans to latch the gates in December and January. So the fare gates have inconvenienced and slowed hundreds of thousands of legit riders, kept many more who can’t figure out the TAP card system from riding entirely, and the best thing that can be said about them is that increased revenue *could* be as high as $6M per year, which *may* make the fare gates break even. If the increased revenue is only enough to install the fare gates, then what good are they? I thought the point was to *increase* revenue, not just to inconvenience people and (maybe if we’re very lucky) break even. I am looking forward to reading David Sutton’s report. He and his staff have done a marvelous job rescuing TAP from near death, and I know that there are many improvements yet to come. I do hope that some of the potential $6 million revenue increase is sent to Metrolink. They have spent $695,000 on 8-months supply of TAP chipped ticket stock and still are running out of chipped weekend passes . The nearly 20 minutes it took me to track down a Metrolink staff member who could help me exchange my non-chipped ticket for one that would open the turnstiles was really annoying. I wonder how many of the turnstile jumpers I later witnessed that day were also holding Weekend Day Passes without TAP chips. You’re not looking at the big picture going forward. That’s $6 million dollar per year in extra revenue from just locking up the Red and Purple Lines alone based on CURRENT ridership figures. If more people start taking the Red and Purple Lines, which as historical trends show that more and more people are turning to mass transit every year, that $6 million a year can grow to $10 million a year quickly, just from latching the gates on the Red and Purple Lines alone. We have more people using Metro Rail today than ever before. We can’t continue to use the honor system; there’s just no possible way to fight fare evasion without efficient use of technology. That is why a vast majority of transit oriented cities around the world uses them, from New York to London, from San Francisco to Tokyo. Is there a link to this report?